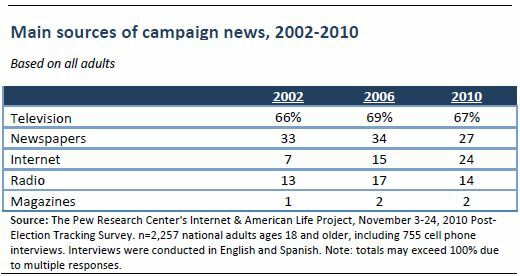 Get political news online – 58% of online adults looked online for news about politics or the 2010 campaigns, and 32% of online adults got most of their 2010 campaign news from online sources. Go online to take part in specific political activities, such as watch political videos, share election-related content or “fact check” political claims – 53% of adult internet users did at least one of the eleven online political activities we measured in 2010. One quarter of all US adults (24%) got most of their news about the 2010 elections from the internet, and the proportion of Americans who get most of their midterm election campaign news from the internet has grown more than three-fold since the 2002 campaign. Among internet users (32% of whom got most of their midterm election news from online sources), 18-29 year olds (36%) and those ages 30-49 (29%), the internet is now the second-most commonly mentioned source of campaign news, ahead of newspapers and trailing only television. Americans feel that the internet makes it easier to meet others with similar political views, but also increases political extremism. They also feel that the internet opens people to a wider range of viewpoints, although many find it difficult to separate good political information from bad. Americans hold diverse views—both positive and negative—about the internet’s impact on the political debate. 54% of online adults say that the internet makes it easier to connect with others who share their views politically: 44% say that the internet makes this “a lot easier” and 10% say that the internet makes this “a little easier.” The internet users who get news or take part in politically-related activities on social networking sites are especially likely to say that the internet helps them connect with others around political issues. At the same time, 55% of all internet users feel that the internet increases the influence of those with extreme political views, compared with 30% who say that the internet reduces the influence of those with extreme views by giving ordinary citizens a chance to be heard. 61% of online adults agree with the statement that the internet exposes people to a wider range of political views than they can get in the traditional news media. Young adults and political social networkers are more likely than average to view the internet as a source of information they can’t find elsewhere. At the same time, 56% of internet users say that it is usually difficult for them to tell what is true from what is not true when it comes to the political information they find online. Despite some of these challenges, 22% of online political users who voted say that they were encouraged to vote by material they found online during the 2010 campaign, and an additional 42% say that political information they saw or read online encouraged them to vote for or against a specific candidate. Some 31% of adult internet users went online to watch political videos in the months leading up to the 2010 elections. When we asked this question after the 2006 midterm elections, just 19% of adult internet users said that they watch political videos—that makes online video watching the activity with the greatest amount of growth out of those we measured in both 2006 and 2010. Supporters of both parties exhibited significant growth in online video consumption over that time, with online video watching by Republican voters roughly doubling between 2006 and 2010. 35% of online adults looked for information online about candidates’ voting records or positions on issues. Whites, college graduates and the financially well-off were especially likely to do this in 2010. 28% of online adults used the internet to research or “fact check” claims made during the campaign. This activity is also especially prevalent among whites, college graduates and those with relatively high household incomes. 16% of online adults sent email related to the campaign or the elections to friends, family members or others; this activity was popular with 50-64 year olds, as 21% of this group shared political emails in the months leading up to the 2010 elections. 12% of online adults revealed online which candidate(s) they voted for in 2010, with voters ages 18-29 leading the way. 8% of online adults signed up online to receive updates about the campaign or elections; another 8% of online adults shared photo, video or audio content related to the campaign. 7% of online adults used the internet to organize or get information about in-person meetings to discuss political issues. 6% of online adults took part in an online discussion group, listserv or other online group related to political issues. These online forums were particularly popular with political liberals and young adults. 5% of online adults used the internet to participate in volunteer activities related to the campaign, like getting lists of voters to call or getting people to the polls. 4% of online adults contributed money online to a candidate running for office; Republicans and Democrats were equally likely to donate money online in 2010. Additionally, 20% of online adults used the internet to follow an interesting election campaign in another part of the country in the months leading up to the November elections. Males, whites and those with strong views (either for or against) the Tea Party movement were especially likely to use the internet to learn about or follow a race outside of their local area. In the 2008 presidential election, we found for the first time that online political users were more likely to say that they typically got online political news from sites that shared their point of view, as opposed to sites that don’t have a particular point of view.3 This trend continued in 2010, as 34% of online political users said that most of the political news and information they get online comes from sites that share their point of view—compared with 30% who typically get news from sites that don’t have a point of view, and 21% who get news from sites that differ from their own point of view. 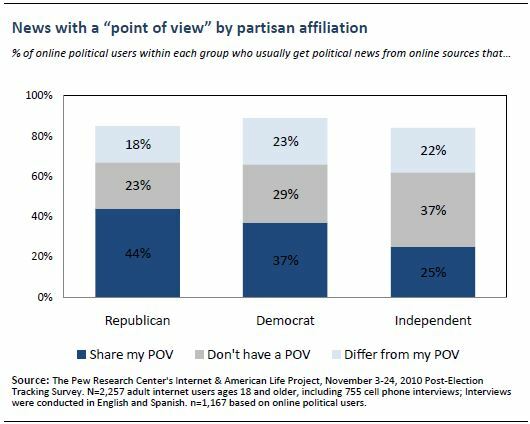 As we found in 2008, views on this subject are correlated with partisan identification—both Republicans and Democrats were more likely than political independents to say that they typically get online political news from sources that share their political point of view. The results reported here are based on a national telephone survey of 2,257 adults conducted November 3-24, 2010. The survey included 755 interviews conducted on the respondent’s cell phone, and interviews were conducted in both English and Spanish. For results based on internet users, the margin of error is +/-3 percentage points.